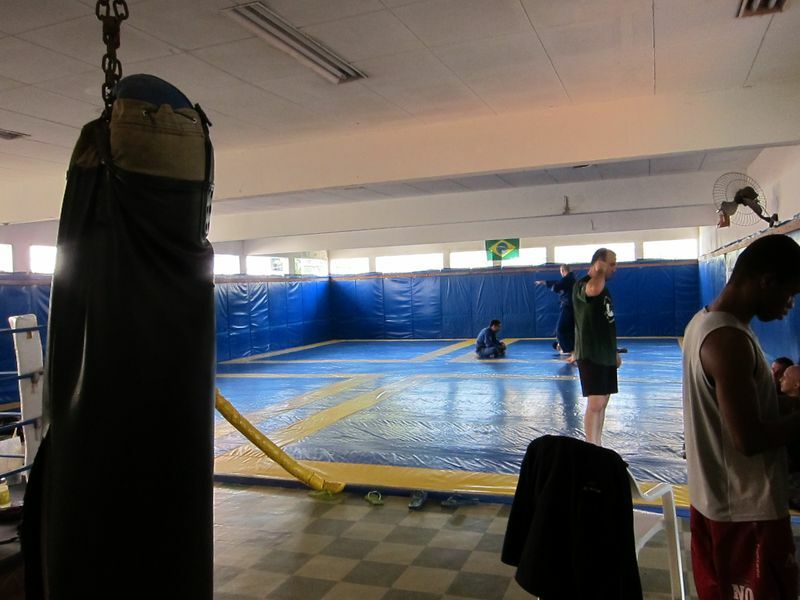 Looking over some of my previous posts, I realized I never posted a follow up to Researching Jui Jitsu training in Rio (August 2010). Oops. Here’s a much belated recap. However the address isn’t really helpful because the driver won’t know the exact number. 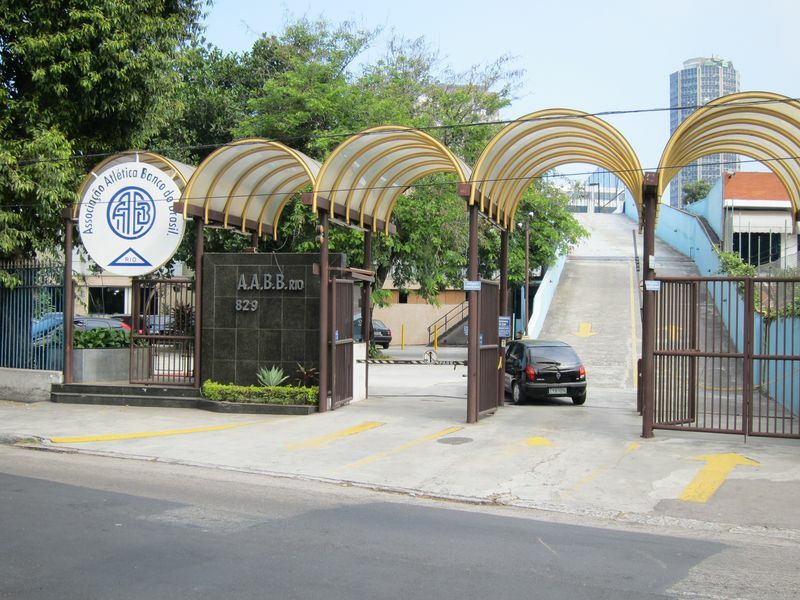 The address is actually for the AABB-Associação Atlética Banco do Brasil‎, a big sports complex/country club complete with tennis courts, swimming pools, gymnasium, showers, and a small outdoor bar (they have Gatorade). The gym is all the way in the back past the pool and tennis courts up on the second floor. I had the name with the address written on a piece of paper and would just show it to the driver so I didn’t have to fumble with the language each time. Another helpful tip is that Aveneda Borges is a big multilane highway with a wide grass divider in the middle. Depending on which direction you come from you might end up on the wrong side of the road and there’s no shoulder for the taxi to stop. 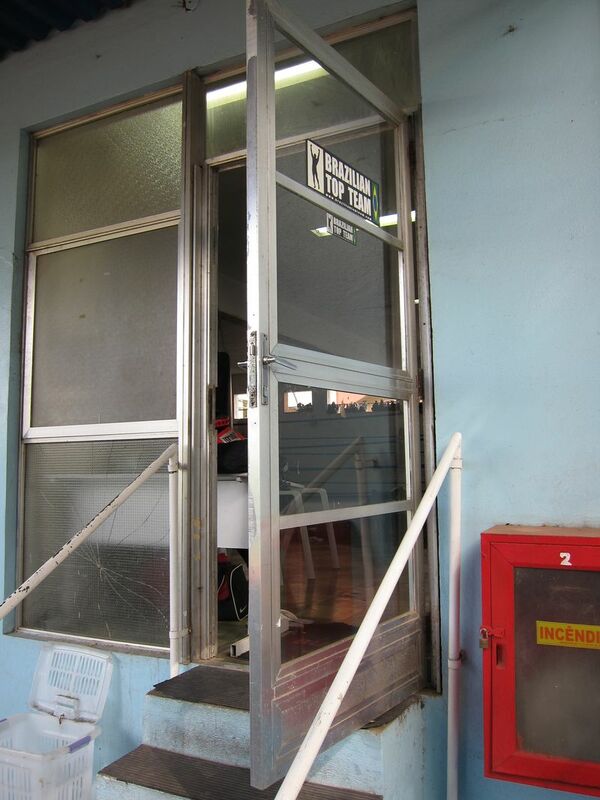 There’s a gas station in the divider directly across from the entrance to the AABB so, you can have them stop there. I also used that as an additional landmark when giving directions. Here’s a Google street view so you can see for yourself. On my first morning, just as Fabiano and I were finishing, a bunch of guys came in for the next class. I asked if I could stick around and train and they were fine with it. I didn’t realize that it was a session for their pro MMA fighters. Also since its no-Gi, no one knows I’m just a white belt (I didn’t get my blue until a few months later). So, at one point I’m about to start rolling with a guy who I find out later is Milton “Miltinho” Vieira, credited with inventing the Anaconda Choke. While we were waiting on the round clock, he asked me a few questions in English about where I was from and how I liked training in Rio. He was really nice. Buzzer sounds, we slap hands and are about to engage, when he pauses and asks what belt I have. I say, ‘White’. He thinks for a moment, shrugs his shoulders and says, ‘OK.’, and then proceeds to run his game all over me. It was like being attacked by ninja ghosts. He had a very open standing game and would engage, disengage, attack, spin until I had no idea where he was coming from at any given moment. At one point, I managed (or he allowed me to) get him in X-guard. I’m stretching him out waiting for him to fall forward or backward to complete the sweep. Nothing. I look for his hands and they’re not on the mat. I start pushing up to get him off balance and then I realize his feet aren’t on the mat. And for a split second I recall thinking, “Is this dude floating in mid-air?”, right before he somehow reappeared on my back. There was this really big guy in the class that I completely avoided. When I got back to New York, a caught a promo for the UFC’s Fight Night the next day and thought, “Wait. That’s the guy.” It was Rousimar Palhares prepping for his fight with Marquardt. I’m glad I trusted my gut/instincts for self-preservation. In all, it was a great experience. I can’t recommend it enough. Pics to follow. I'm planning a very last minute trip to Rio at the end of the month and of course when you think Brazil, you think Brazilian Jui-Jitsu. No? Well, I do. As I've mentioned in previous posts, I've been training at Ronin Athletics in NYC for approximately for over three years now. From everything I gather, training in Rio is a required stop on the way to awesome. So, all aboard! In doing my own online research, I was really surprised at the lack of information on some of the better academies in Rio. 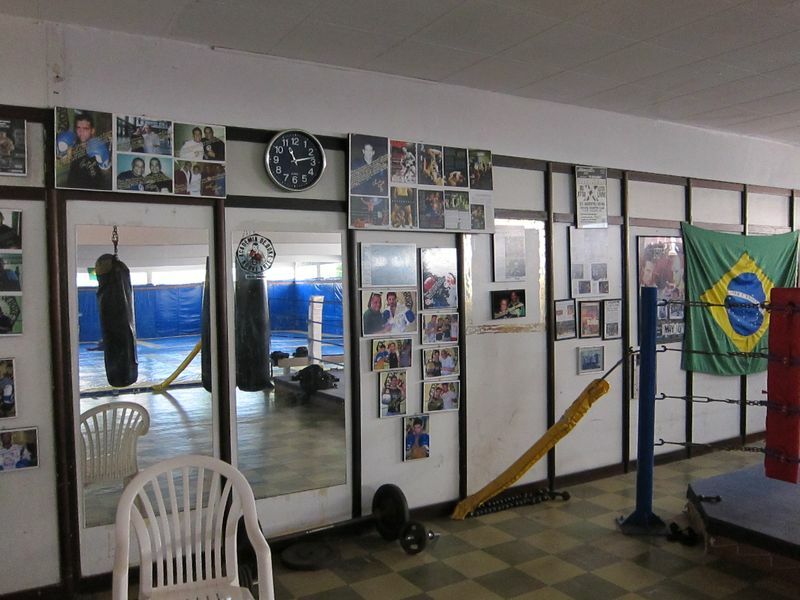 There are probably more great instructors and gyms per square mile (or kilometers, for you metric wierdos) in Rio than in any other city worldwide. But you wouldn't know that from some of their websites. I came across a lot of dead links, gratuitous flash intros/headers slowing down the page loading time, white text on black background (ew…), images with no regard for file size or aspect ratio, and Google Adwords that showed ads for their competitors. Now that may sound like a techie being all snobby, but what was most egregious in most cases I could not find the only two pieces of information I wanted; where are you located, what is your schedule. So, to save you some time in your own research I thought I'd share my notes. I can't vouch for the accuracy of all this information at this time. It looks like instructors move, schedules change, places close/open with some regularity. Some posts I saw that were only a year old were already outdated. I'll try to correct any inaccuracies when I get boots on the ground (or feet on the mat in this case). As I've experienced, researching locations and making arrangements is not so cut and dry. To that point, Dennis Asche has started a business to facilitate this process. You may want to forgo the rest of this post and just contact him and let him do the leg work. That being said, he does list academies and their contact info which you can use to go it alone. 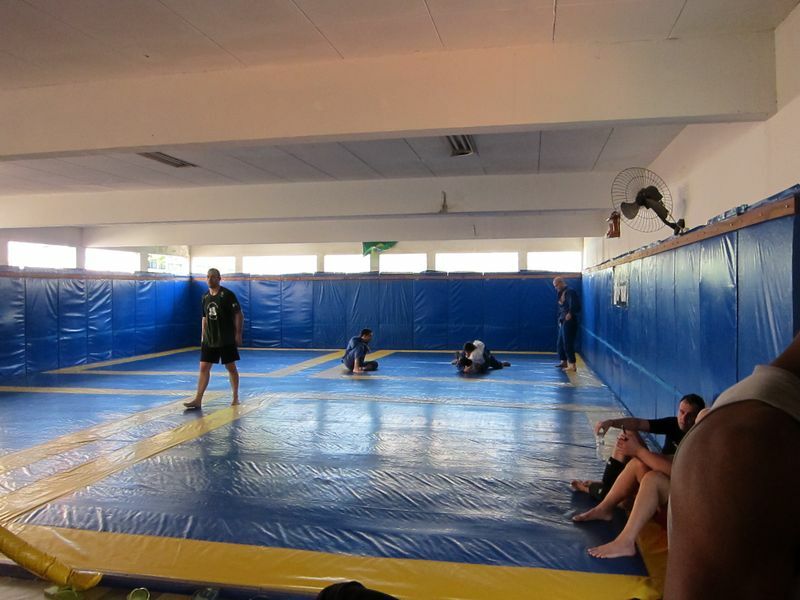 Great first person account of training in Rio. Focuses mainly on Gordo BJJ and Fight Zone (more on those later). Much more useful, coherent, and current then some of the one-off posts found on Sherdog and similar BJJ forums. Another good first person account. Though, well edited and a bit rambling at times. However, sorting through the dense text I was able to glean some very useful information. Between the three years of reports, almost every club in Rio is mentioned at least once. I'm assuming the quality of BJJ instruction in Rio is world-class pretty much across the board, so while I was partial to some schools (Equipe Brasa, De la Riva, Top Team) location and schedule are going to be my deciding factors. I'm traveling with my wife, so I do want to leave some time in the day for sightseeing. So, what I list here is what information I was able to glean on some (probably only a small percentage) of the academies in and near the Copacabana area in order of personal preference. As an added bonus, I put together a Google Map showing all the locations. No complaints about this site. Found the info I wanted in a few seconds. Location. Check. Schedule. Check. Nice. Also mentioned favorable in a number of other sites. Their site is dominated by Evolve (which I guess is an Asian MMA team they're affiliated with), so the focus is not on the Rio location which is called "Evolve Barra da Tijuca". No hours listed. Most guidebooks I picked up cited this website, though it seems more like its the site for the entire juggernaut of an organization that is Gracie Jui-Jitsu rather than those just in Rio. It took me quite a while to navigate the list of official schools to find those in Rio. Then I had to Google Map each one to see what was close to the Copacabana area. Exhuasting. Itanhangá and Botafogo were the closest to Copacabana. The latter has its own site, http://www.graciebarrabotafogo.com, which appears dead at this time. Now maybe its a silly assumption on my part, but I have no idea why Carlos Gracie and Royler Gracie have different sites. I was also confused as to why the Humaitá academia wasn't on the 'official' list above. Now, I'm more an actual practitioner of BJJ than I am the type of fight fan with Tapout gear and who can recite the entire Gracie family tree from Helio down. So if you are, then you may think its obvious because they A) don't like each other B) don't have the same mother C) liked the same girl in high school or D) don't like each other. I don't know and I don't care. And also, D) I don't care. That being said this provides a good list of some other possible places to check out with the Humaitá location being the closest and hours listed. Yet another Gracie with his own organization. Oddly enough, the site makes no mention of the location in Copacabana that was listed on Connection Rio's site, so I'm not even sure it still exists. Here's the address. Once my housing arrangements on confirmed, I'll probably narrow down this list further. Once I'm in country, I'll come back to this post and correct any errors I may discover along the way. Hope this helps any fellow practitioners looking to train in Rio.